Back when ECW was still around, the WWE had Mark Henry dress up like Santa Claus and cut a promo on Hornswoggle. Admittedly, I didn't watch a whole lot of the ECW show and I don't remember Henry and Honswoggle feuding. I only recall them teaming up on Raw a couple of years ago. This was well before Henry's push to the World heavyweight title, but I must say, he does a pretty good job with the "Santa Gangsta Rap." 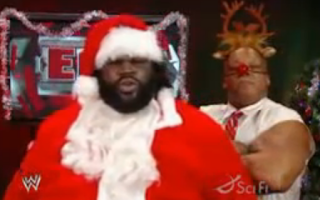 I'm not sure why Tony Atlas is standing behind him as Rudolph. He looks pretty funny, but at least he's not doing that annoying laugh. Anyway, enjoy a tune from the World's Strongest Santa.